A recipe for sweet potato quick bread. 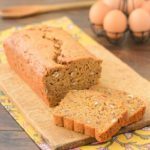 It is a moist bread made with cooked and mashed sweet potatoes, chopped pecans, and brown sugar. Great toasted and served with butter. Preheat oven to 325 degrees F. Lighly grease a 9- X 5-inch loaf pan. Whisk together flour, baking powder, salt, cinnamon, ginger, granulated sugar, and dark brown sugar in a large bowl. Stir in chopped pecans. Whisk together eggs, oil, applesauce, half-and-half, and sweet potato in a medium bowl until smooth. Add wet ingredients to dry ingredients. Stir just until moistened. Bake for 60 to 70 minutes or until a toothpick or cake tester inserted in the center comes out clean. Use a knife to loosen the bread from the edges of the pan. Remove bread from pan and cool completely on a wire rack.